Okay, I am quite proud of this little project. This was one of those ideas that started small and simple and morphed into something bigger. My husband actually ended up helping me with a lot of it, so it became a joint project. 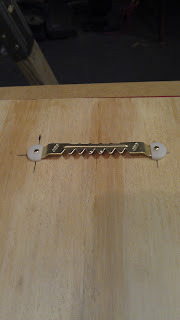 I had seen some jewelry organizers on Pinterest that involved cabinet knobs attached to a board. I thought they were pretty cute, and started thinking about how I could modify the idea to go with my bathroom. 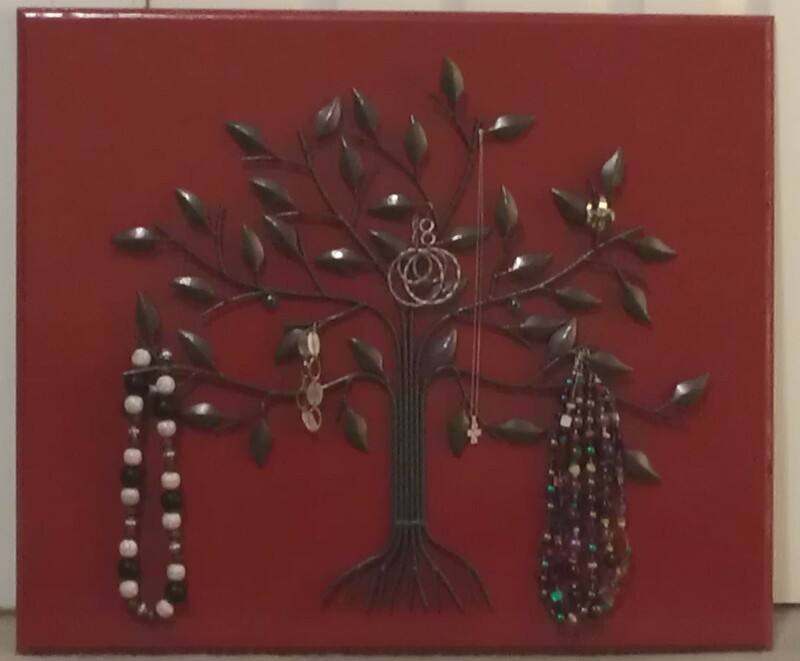 We have a bare tree theme going on in our bathroom, so I suddenly had this picture in my mind of jewelry hanging from tree branches. I sketched it out and showed my husband, and we toyed around with some ideas, like attaching cup hooks to the ends of branches on a tree poster. My hubby helped me find a board to mount it on. 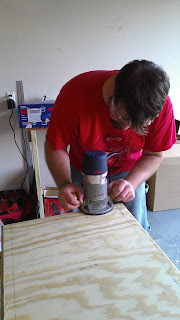 He helped me get the board ready to paint by cutting it the size I need and using a router to make the edges pretty. Yay power tools! And yay for husbands who don't mind helping their wives with projects! After the edges were pretty, I painted the board. See that nice, professional edge? I painted it with an acrylic paint, let it dry overnight, and gave it a second coat. 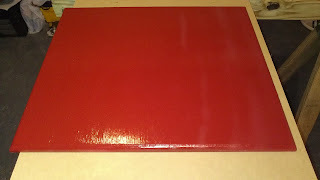 This particular type of paint dries flat, so I covered it with a clear spray finish. It took three coats of the stuff for it to finally coat evenly and give me the shine I wanted, but boy, does it look pretty now! 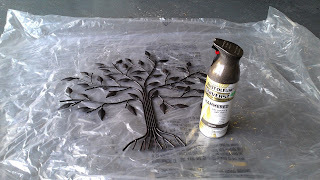 Between working with the red and clear paints, I was also working on the tree. I liked the original black metal, but our bathroom is mostly red and brown, and I just don't do brown with black most of the time. 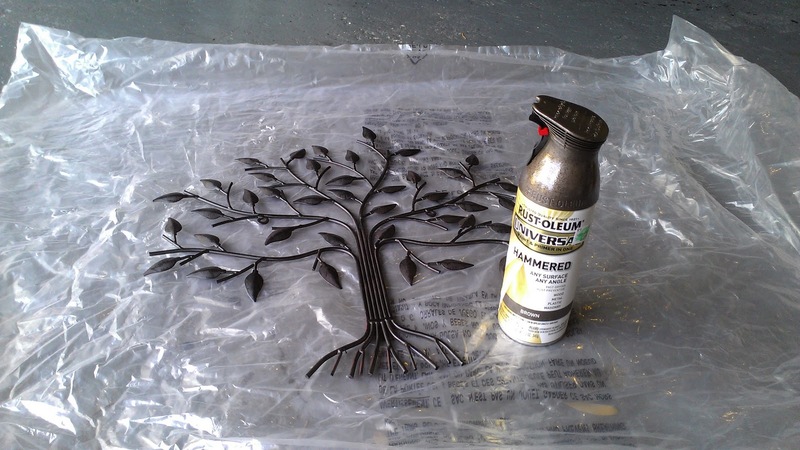 However, I didn't just want to spray paint the tree, because I thought that would look terrible on the metal. So I bought a hammered metal finish spray paint in a grayish-brown color. I applied two coats of this, although one probably would have sufficed. I absolutely love the new color, and the finish! 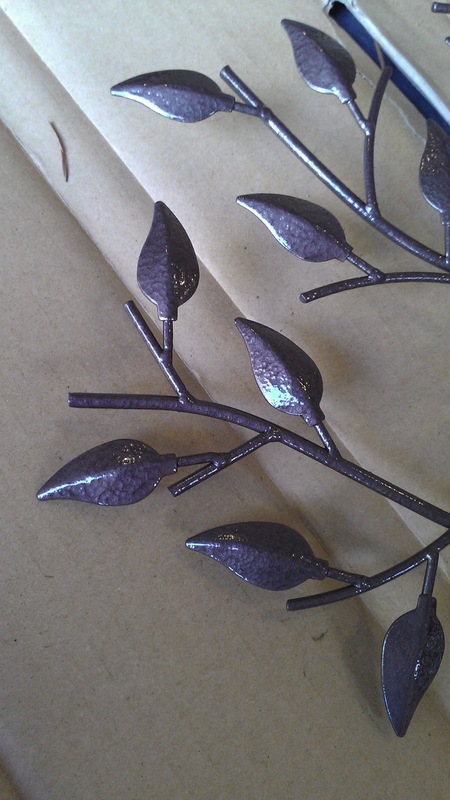 Just look at those shiny, metallic leaves! 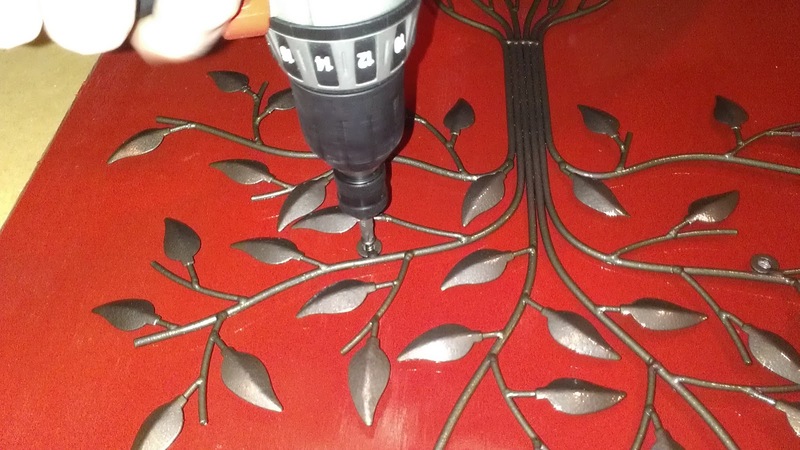 After the board was dry, my husband attached some hardware to the back so that I could actually hang the finished piece on the wall. Finally, I was ready to mount the tree onto the board. 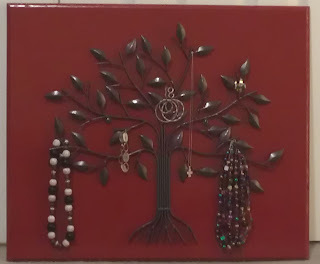 My husband pointed out, though, that the tree was made to hang flat against the wall, and asked how I planned to hang jewelry on it if the branches were pressed tightly against the background. We ended up stacking three small washers right behind the hanging holes to make the tree stick out a little from the board. You can't see it in this picture, but the washers are right underneath the little circle piece on the tree that he is drilling into. He just put the screw through the tree and the washers as he attached it. 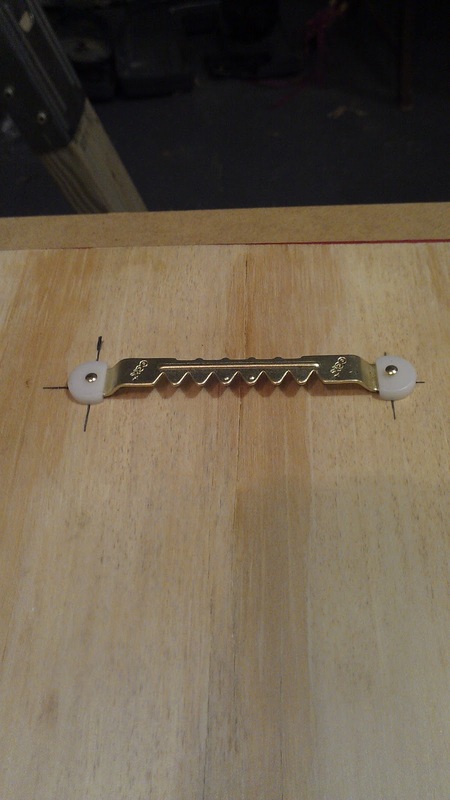 It's very secure, but it leaves a gap so that I can easily hang jewelry on it. 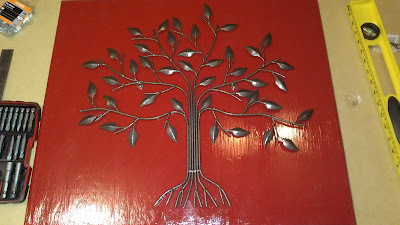 I love the way the new color of the tree stands out against the rich red background! 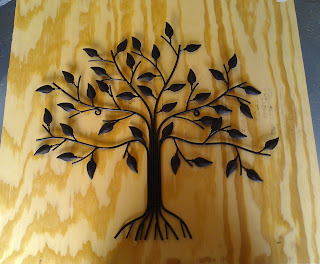 I love it so much that I would hang it up even if I never put jewelry on it! This project could be made using all different kinds of metal work, as long as it is intricate enough to give you places to hang your jewelry. 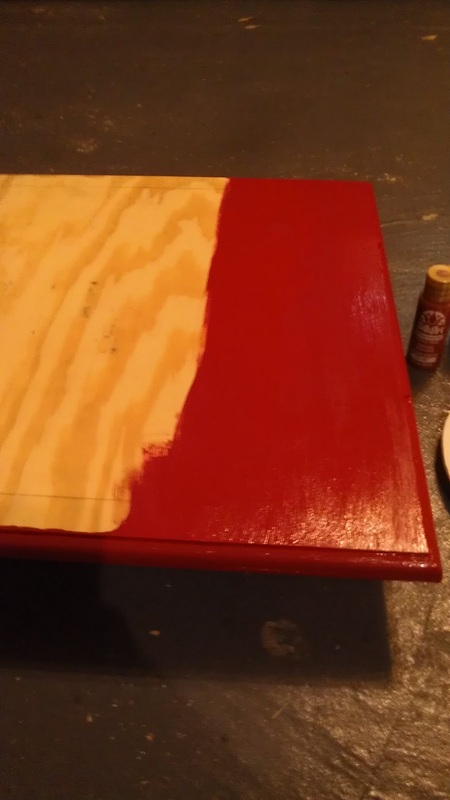 If you'd like, it could also be done in a much simpler way, by not painting it and by mounting it to something already finished, like a cute picture or print. What is the color name of that spray paint?? Very cute!